This post is not going to be very long. You may remember my post where I complained about Safari for Windows beta bugs. Well, I gave this browser another shot and downloaded it again. Now the About box says 3.0.3 and everything works fine for me. The first beta release was probably not compatible with localized versions of Windows. 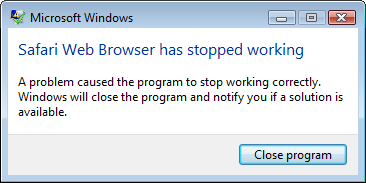 Great job Apple, I wish you never released the first beta because it must have given this browser a bad name among Windows users. The current release works fast with no major bugs. All I can complain about is the lack of advanced features, even IE7 is more comfortable, so this is why I’m gonna stick with my Firefox and use Safari just for website testing. You can download the latest Safari for Windows here. It won’t run on many computers. I tried Safari on two Windows XP PCs and one Windows Vista PC and it worked just on the last one. Both Windows XP computers did nothing when Safari.exe was executed. It might have been caused by the fact that I unchecked the “Install Bonjour” checkbox on those Windows XP systems but the browser is supposed to work without this, isn’t it? Heading tags that contain links are hardly rendered correctly. They’re just missing on most sites. The Bookmarks button doesn’t work. Every time I click this button, the browser crashes. It’s too slow for me. The official site says it’s the fasted browser ever. Compared to Firefox and Opera, Safari for Windows is extremely slow. Also the interface animated effects make working with the browser slower. I wonder why they don’t use smooth scrolling. If all the major bugs get fixed in the final release, Safari will provide a decent browsing experience on Windows and the web developers will be happy for not having to get a Mac or Mac emulator to test and debug their sites. That’s it for today, these were my first impressions about Safari for Windows, expect more to come tomorrow. And what’s your opinion about Safari for Windows? Share it in the comments below.